Never minding of course that certain realities would have to change for some service expansions to occur I suspect, such as that Kendall and DeKalb would have to join the RTA for Metra to expand beyond the existing 6 county area. And I won't get into proposed future stations that are scheduled to eventually open(i.e. Romeoville on Heritage Corridor), or how very limited service is on some lines like North Central Service to Antioch, Heritage Corridor, etc. Myself, I've been starting to think that expanding the Milwaukee District North line northwest from Fox Lake to Richmond, IL(w/a stop south of that town) would be interesting, with perhaps an intermediate stop(s?) for Spring Grove and/or Solon Mills. I'd suspect at least Spring Grove would support a station, if not Solon Mills. And since McHenry County is already part of the RTA, you'd think this would get more serious consideration. If you ask me I wouldn't mind stops also in both Zenda and Walworth in Wisconsin, but who knows how likely that'd occur since there'd probably be a need for a sales tax mechanism(or something) to fund service beyond Richmond? Zenda of course was an intermediate stop back when the Amtrak Lake Country Limited(which mainly doubled as a U.S. Mail train) to Janesville, WI ran, before that was eliminated years ago. Obviously I wouldn't mind BNSF being expanded west of Aurora to somewhere in Kendall County, regardless if that's ultimately Yorkville or Plano(latter being served by Amtrak, and I presume a la Naperville for Galesburg/Quincy bound trains, and Glenview on Hiawatha/Empire Builder trains, that Amtrak would probably restrict Chicago to Plano travel on Amtrak trains if Metra one day expands service that far west). I have my doubts that a service expansion would quite get to Sandwich or Somonauk. Of course a Kendall expansion would mean they'd have to reconfigure the current Aurora station. And ultimately would mean building a new platform on the mainline BNSF track beyond Aurora, and eliminate the existing platform. Not sure if the Aurora yard would have to be relocated to serve however west such a service expansion would go to, or if it'd stay in Aurora with only limited runs going beyond Aurora? I remember being surprised 10ish years ago, when I noticed that all Union Pacific West runs(save for a few weekday rush hour train runs) started to terminate/begin in Elburn, instead of just a few beginning or ending in Elburn. The latter(limited train runs) is the case to this day on the Union Pacific North line for service between Waukegan and Kenosha, and also for service between Orland Park-179th and Manhattan on the Southwest Service line. And of course, a service expansion to DeKalb, IL beyond Elburn would be nice for the Union Pacific-West line, with intermediate stops in Maple Park and Cortland. I suspect this'd mean a new side track would have to be built(a la what occurred between Geneva and Elburn) to enable service going further west, plus that a new eastbound platform would have to be constructed in Elburn as it'd no longer be the western terminus. Johnsburg would seem like a logical 1 stop extension proposal for the McHenry, IL Union Pacific Northwest branch, and has been proposed before by Metra. I doubt the tracks will ever be reconstructed north of Johnsburg, IL to Lake Geneva(where train service used to go till 1975, and a bike trail exists for much of that old track route today), sad to say. And of course I recall the talk years ago in Wisconsin(back when James Doyle was governor there) for commuter train service to occur between Kenosha and Milwaukee with an intermediate stop in Racine(and perhaps others? ), that got killed off once Scott Walker became governor there. Another idea I thought of really late(which'd require a connecting track to another freight line west of Big Timber Road), would be an expansion of Milwaukee District West service serving Gilberts, Huntley, Union, and Marengo. I'm betting such service would need a 2nd track to accommodate freight train runs, and balance out Metra and freight train runs. If that isn't done, of course it might also be possible to expand Elgin service on Milwaukee District-West to Hampshire. Anyway, feel free to discuss what you'd like to see occur. Even if it isn't politically likely to happen, that's fine to discuss here. I remember being surprised 10ish years ago, when I noticed that all Union Pacific West runs(save for a few weekday rush hour train runs) started to terminate/begin in Elburn, instead of just a few beginning or ending in Elburn. The latter(limited train runs) is the case to this day on the Union Pacific North line for service between Waukegan and Kenosha, and also for service between Orland Park-179th and Manhattan on the Southwest Service line. That's because the new Elburn yard replaced the old one when the extension opened. UPN and SWS have yards at Waukegan and 179th, respectively, allowing trains to terminate there. The construction of the last set of extensions (Elburn, NCS and SWS) was financed by New Starts money. The availability of that source of money to Metra since then has been questionable (such as extending the McHenry Branch to Johnsburg having left the room about 10 years ago). There was talk about the STAR Line, but that now also seems dead. There would have to be operating money as well as capital money. 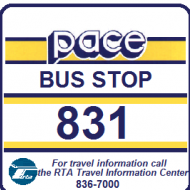 Aside from the issue of Kendall County not being in the RTA, ridership, the fare schedule increments, and sales tax collections in McHenry County do not support offering more service there. The freight railroads don't want to give Metra further rights on their tracks. Something like the Milw N north of Rondout to Wadsworth may be possible, but running anything more on CN or UP freight property would result in intense opposition. You don't discuss intrasuburban travel, something Metra does not do well, but you seem to assume that people living in farm country have to commute to work in the central city. If someone out near DeKalb wants to do that, they can drive to Elburn. As noted several years ago, Pace offered a feeder from Oswego to Aurora, but after the federal grant ended, Oswego dropped Pace and used Kendall Area Transportation, and it has been indicated that if Oswego wants a train station, it will have to pay for it. Metra should focus on their current system. The downtown market is stagnent compated to the suburban employmwnt growth. Busjack is correct those in rockfors are going to elgin and schaumburg maybe rosemont not so much to dt chicago. Metra should focus on double tracki g fox lake branch and expanding north cenyral service. They sold the nw communities a bill of goods about service expansion and have lied to those communities. Another thing metra should also focus on current markets including more reverese service and decent weekend service. 2 hour service is a joke on weekends such as nw up. And they start late on weekends one cant use it as a reliable service. .
expanding north cenyral service. They sold the nw communities a bill of goods about service expansion and have lied to those communities. As I indicated above, Metra started the project when the Wisconsin Central still owned the railroad; once CN bought it out, CN became impossible to deal with. Metra did get one more train. The downtown market is stagnent compated to the suburban employmwnt growth. That doesn't seem to be the case with all the poaching from the suburbs, such as McDonald's, what's left of Motorola, Kraft, etc., but, by the same token, the companies claim they are relocating to the city because the Millennials live there, so there isn't any ridership growth for Metra, one way or the other. 2 hour service is a joke on weekends such as nw up. And they start late on weekends one cant use it as a reliable service. In that their only weekend fare generating business is $8 passes and family fares, if the trains are not packed now, no incentive to increase weekend service. 2 hour service is a joke on weekends such as nw up. And they start late on weekends one cant use it as a reliable service. .
Ridership on weekend trains is really hit or miss, mainly because the primary market is recreational travel. Every two hours is enough, as long as extra trains are operated when events that draw large crowds occur. It would take a market survey to justify that, especially since those people, already being on a pass, won't pay a fare to go home (and hence they have to sell enough inbound passes to justify it). I suppose they could do a survey in front of The Civic Opera House or [some car co. or bank] Theater, but I doubt that they find much. This is very true. The first BNSF train from Aurora on Sundays is not a crowded train, except on Sundays when the Bears are playing at Soldier Field. Then the train is full and usually late. A local shopping paper had an article that to increase Hiawatha service from 7 trains each way to 10, they'll need a 2-mile long passing siding from about Lake Ave. to near Techny. Although the article talks about property values, most of the adjoining property is industrial, except for the TOD near the North Glenview station (which, IMO, would need a pedestrian underpass if trains are parked there). I'm bringing this up, only because extending passenger trains is not so easy as one would believe. Related is a Daily Herald article that a third track is being constructed along the UP-W, from Geneva to West Chicago, and from River Forest to Melrose Park. Well, the Romeoville station is officially happening. Romeoville station is now open. Thanks for explaining all of thsee issues, very well. Cam see your point about those freight railroads not wanting to approve more Metra service, and give more rights for passenger Metra service (sigh). I forget it had been like 10ish years, since the idea to expand UP-NW McHenry branch trains to Johnsburg was first proposed. Also, I've assumed like you that the STAR line proposal is dead. Sorry I wasn't more clear about intersuburabn travel, since you are right Metra mainly is only useful if you're going to downtown Chicago, or to other communities also on that same route. Save for very rare exceptions (i.e. between North Central and Milwaukee North at Prairie Crossing), you are correct that generally riders can't connect between Metra lines out in the suburbs. Also to clarify, I never brought up a Roundout to Wadsworth Metra extension. I'm not sure if many riders would use that, since except for a forest preserve by there and limited suburban residential developments/subdivisions, I don't know if that'd get a lot of ridership. NOT against this idea by any means, if Metra(and Wadsworth) ever wanted to do that though. I do still wish Metra's UP-W line to Elburn could be expanded to DeKalb, with a few intermediate stops possibly (mainly Maple Park and Cortland). I concede that short of DeKalb County joining the RTA, city of DeKalb ponying up a lot of new sales tax funds to pay for station construction, and getting Union Pacific to not oppose this idea, it probably won't occur. Ditto with any Metra BNSF expansion to Kendall County, which of course has been discussed very well (and including the 907 Pace feeder bus elimination) on other threads. Cam see your point about those freight railroads not wanting to approve more Metra service, and give more rights for passenger Metra service (sigh). One can look up all the stories about the CN resisting more service on the NCS and EJ&E (essentially STAR Line), because it is only interested in freight. Also to clarify, I never brought up a Roundout to Wadsworth Metra extension. Again, that's something that's been kicked around. More recently, there is the stink that Amtrak wants holding tracks on Metra property, and while Metra, with the usual disclaimers about not having any money to do anything, says that rebuilding a third track and interlocker near Rondout is possible, it hasn't placated Glenview. Does anyone know how much adding (or subtracting) a car on an individual train would add/subtract the cost of operating that train? Maybe adding more trains with less cars to offset the cost would help. I'm sure it would not even be close to a 1:1 savings, but may help justify. Adding the car means at most adding a conductor. More trains certainly won't. Besides needing a whole crew, there is the problem on the BNSF that the time to reset positive train control when changing the train's direction messed up the schedule. More trains just compounds that. Some other lines would just have more contention with freight traffic. Metra would also undoubtedly cry that it doesn't have the additional locomotives that would be needed. Exactly what are the causes of the PTC delays when flipping the trains at the end of the line? Isn't this a computerized system & shouldn't it be just a simple software fix? I think he was referring to the additional time to reprogram the PTC computer has made the schedules off. Why do the engineer's have to reprogram the PTC computer? Shouldn't that process be simple & just hitting one or two keys & then walk to the other end of the train? If the system can't be that simple, then something is wrong with the system! I don't know the technical reason, but the system can't be as simple as just putting a run number in a CTA car, because, among other things, it has to interact with all railroads on the mainline. I'm not an expert in this area, but I don't think it's quite that simple. Railroads are dispatched from different locations all across the country. Thus you have different equipment interactions out of Union Station you have different Metra lines and Amtrak. Then you have to factor in the freight trains. BNSF trains I believe are dispatched in Iowa, even the Metra ones. The different equipment must interact with each other, the signals along the way.and dispatch. PTC is to aid in keeping trains at a safe distance from each other as well as a backup to avoid disasters in cases of human error (engineers misreading or missing signals or falling asleep at the controls). Even on airplanes, it takes minutes for pilots to input preflight data into their computers before they leave the gate and it must match the info that is prescribed for them by air traffic control. From what I have heard, the PTC system has to be reprogrammed with how many cars/locomotives and the route/line/run itself. I believe it only takes 5-10 minutes to program it.